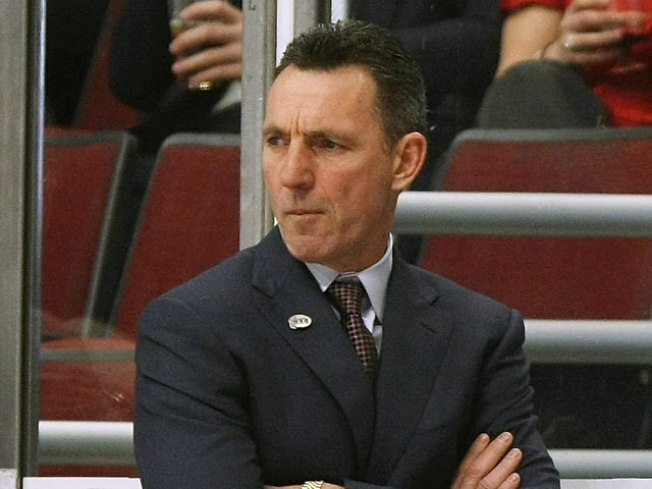 Will the firing of Blackhawks Denis Savard be the major shakeup in the front office? In the midst of last season, former Blackhawks head coach Dennis Savard made an infamous rant where he called on his players to be "committed to the Indian." "They've got to commit to the Indian," Savard fumed. "If they don't want to commit to the Indian, let's go upstairs and we'll get 'em out of here." Of course, a little over two weeks ago we learned that the Indian was not committed to Savard when he was dismissed with a record of 1-2-1. In 147 games as Hawks coach, Savard posted a 65-66-16 record. He was replaced by Joel Quenneville, former coach of the Colorado Avalanche, and scout for the organization. Under Quenneville the Hawks are 2-1-2heading into Saturday's matchup with the Dallas Stars. Heading into this season of ultimate Blackhawks renaissance, it was pretty well known that Savard and current General Manager Dale Tallon were favored by late former owner Bill Wirtz, but not as much with current chairman Rocky Wirtz. So does that mean Tallon will be the next one fired? And if so, when? Only the very top of the organ-I-zation (spelled that way intentionally for proper Canadian-English pronunciation) can say for sure. One thing we can certainly expect is more influence from NHL legend Scotty Bowman, the team's Senior Advisor of Hockey Operations who was signed this offseason. Conventional wisdom says that he had major influence regarding the coaching decision, and will in future decisions to come. If Tallon is canned in midseason, then perhaps his son, assistant GM of Hockey Operations, Stan Bowman, would serve as interim GM. Or maybe even both Bowmans could share job duties in this situation. This franchise has made a dramatic improvement in almost all departments of the organization, but the transformation won’t be complete until they reach the playoffs for the first time in six years. And if Quenneville doesn't get the job done effectively this season, it won't be long until Bowman -- and by that I mean the elder, the man with nine Stanley Cups on his coaching resume -- will be behind the bench leading the team. Read more of Paul Bank's work on on the The Sports Bank and the NBC Chicago Street Team blog.